Comparison of Bicubic interpolation with some 1- and 2-dimensional interpolations. Black and red/yellow/green/blue dots correspond to the interpolated point and neighbouring samples, respectively. Their heights above the ground correspond to their values. In mathematics, bicubic interpolation is an extension of cubic interpolation for interpolating data points on a two-dimensional regular grid. The interpolated surface is smoother than corresponding surfaces obtained by bilinear interpolation or nearest-neighbor interpolation. 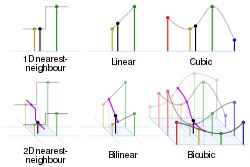 Bicubic interpolation can be accomplished using either Lagrange polynomials, cubic splines, or cubic convolution algorithm. In image processing, bicubic interpolation is often chosen over bilinear or nearest-neighbor interpolation in image resampling, when speed is not an issue. In contrast to bilinear interpolation, which only takes 4 pixels (2×2) into account, bicubic interpolation considers 16 pixels (4×4). Images resampled with bicubic interpolation are smoother and have fewer interpolation artifacts. consisting of 25 unit squares patched together. Bicubic interpolation as per Matplotlib's implementation. Colour indicates function value. The black dots are the locations of the prescribed data being interpolated. Note how the color samples are not radially symmetric. Bilinear interpolation on the same dataset as above. Derivatives of the surface are not continuous over the square boundaries. Nearest-neighbor interpolation on the same dataset as above. that is continuous and has continuous derivatives. Bicubic interpolation on an arbitrarily sized regular grid can then be accomplished by patching together such bicubic surfaces, ensuring that the derivatives match on the boundaries. to be calculated quickly and easily. If the derivatives are unknown, they are typically approximated from the function values at points neighbouring the corners of the unit square, e.g. using finite differences. At the edges of the dataset, when one is missing some of the surrounding points, the missing points can be approximated by a number of methods. A simple and common method is to assume that the slope from the existing point to the target point continues without further change, and using this to calculate a hypothetical value for the missing point. produces third-order convergence with respect to the sampling interval of the original function. The lower half of this figure is a magnification of the upper half, showing how the apparent sharpness of the left-hand line is created. Bicubic interpolation causes overshoot, which increases acutance. The bicubic algorithm is frequently used for scaling images and video for display (see bitmap resampling). It preserves fine detail better than the common bilinear algorithm. However, due to the negative lobes on the kernel, it causes overshoot (haloing). This can cause clipping, and is an artifact (see also ringing artifacts), but it increases acutance (apparent sharpness), and can be desirable. ^ R. Keys (1981). "Cubic convolution interpolation for digital image processing". IEEE Transactions on Acoustics, Speech, and Signal Processing. 29 (6): 1153–1160. CiteSeerX 10.1.1.320.776. doi:10.1109/TASSP.1981.1163711.